Whatever happened to “Pelorosaurus” becklesii? Looks like “Pelorosaurus” becklesii is actually Haestasaurus becklesii! Fig 1. Map showing England and Wales, with boundaries for English counties. 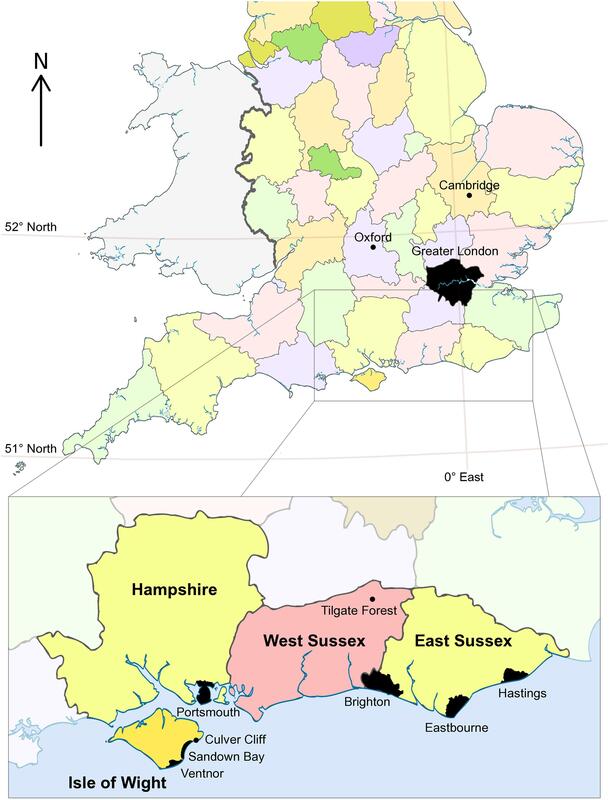 The magnified inset shows the Isle of Wight and East and West Sussex in more detail, marking the positions of selected major towns/cities and the fossil localities mentioned in the main text. Based on “English ceremonial counties 1998” by Dr. Greg (see the Wikipedia website at http://en.wikipedia.org/wiki/File:Englis​h_ceremonial_counties_1998.svg. : accessed 1st August 2014): CC By-SA 3.0. Fig 2. 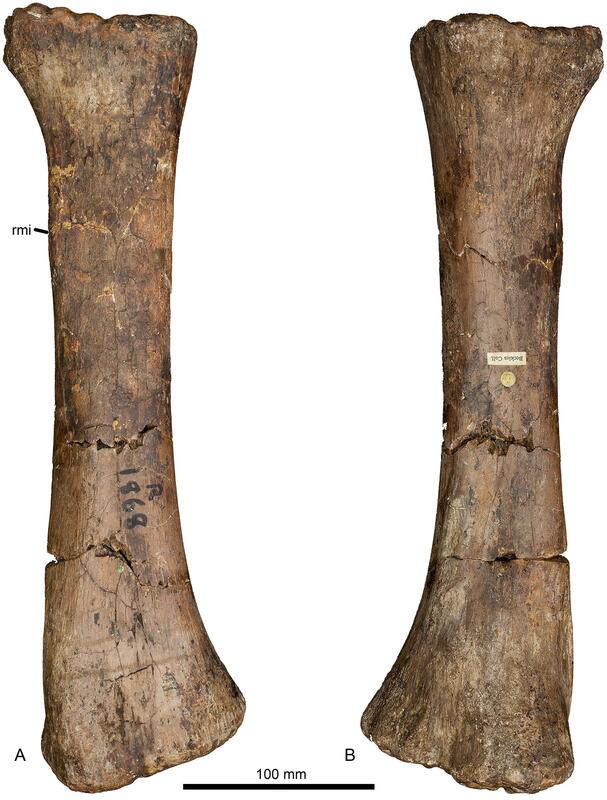 Left humerus of Haestasaurus becklesii (NHMUK R1870). A, anterior view; B, posterior view; Abbreviations: af, anconeal fossa; dp, deltopectoral crest; hh, humeral head; ltf, lateral triceps fossa; mtf, medial triceps fossa. Fig 3. 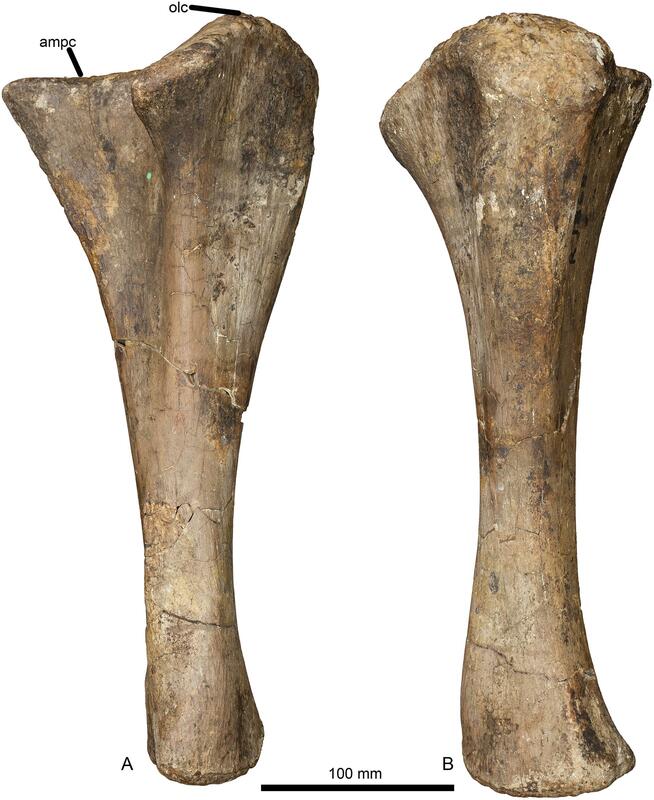 Left humerus of Haestasaurus becklesii (NHMUK R1870). 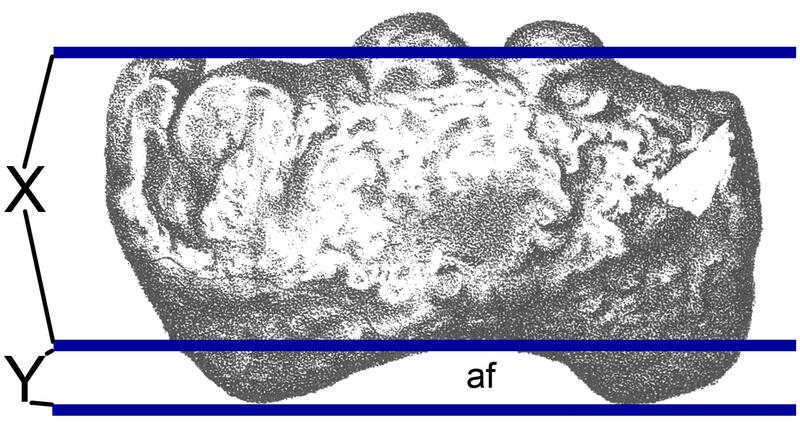 A, lateral view; B, medial view; C, proximal end view (posterior surface towards top); D, distal end view (anterior surface towards top). Abbreviations: aep, anterior entepicondylar process; af, anconeal fossa; alf, anterolateral fossa; dp, deltopectoral crest; hh, humeral head; lad, lateral anterodistal process; mad, medial anterodistal process. All parts are at the same scale. Fig 4. 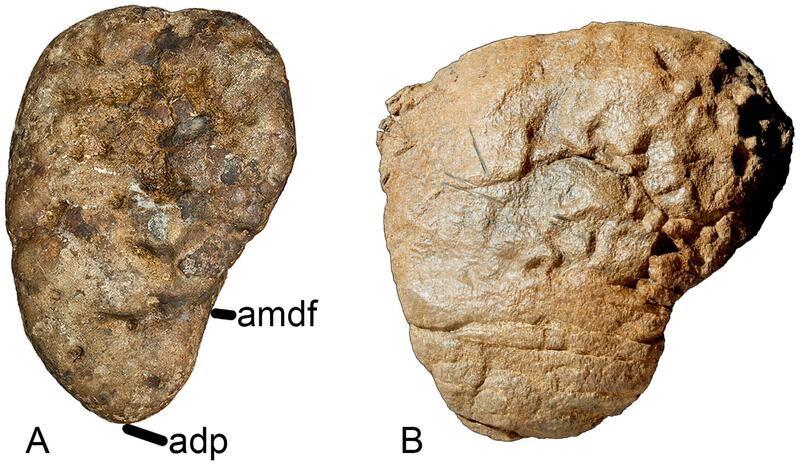 Exemplar profiles of the distal ends of sauropod left humeri (anterior surfaces towards top). 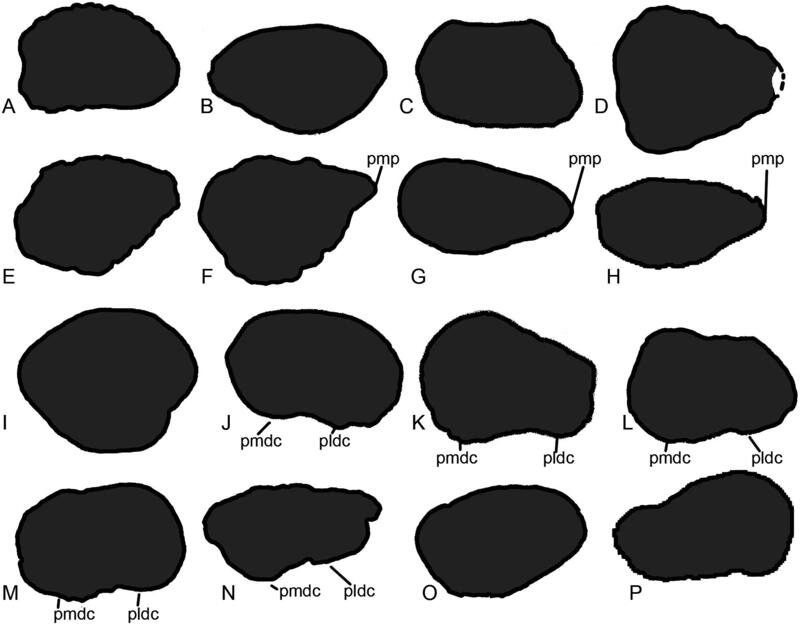 A, Mamenchisaurus youngi (ZDM 0083 ); B, Ferganasaurus (PIN 3042/1 ): C, Apatosaurus excelsus (YPM 1980 ); D, Camarasaurus grandis (YPM 1901 ); E, Haestasaurus (NHMUK R1870); F, Giraffatitan (MfN MB.R 2181 : a right humerus that has been reversed to facilitate comparison); G, Epachthosaurus (UNPSJB-PV 920, based on a photograph by PDM); H, Diamantinasaurus (AAOD 603 ); I, Neuquensaurus (MLP-CS 1050 ). Abbreviation: aep, anterior entepicondylar process. Profiles not drawn to the same scale. Fig 5. Left ulna of Haestasaurus becklesii (NHMUK R1870). A, anterolateral view (with anteromedial process directed mainly medially); B, posterior view (with posterior process directed towards the observer). Abbreviations: ampc, concave surface of the anteromedial process; olc, olecranon. Fig 6. Left ulna of Haestasaurus becklesii (NHMUK R1870). A, lateral view; B, anteromedial view; C, proximal view; D, distal view (N.B. the anteromedial process of the proximal end is visible in this view). Abbreviations: adp, anterior distal process; alp, anterolateral process of the proximal end; amdf, anteromedially facing fossa immediately above the distal end; amp, anteromedial process of the proximal end; raf, fossa for reception of the proximal end of the radius. All parts are at the same scale. Fig 7. Left radius of Haestasaurus becklesii (NHMUK R1870). A, anterior view; B, posterior view. Abbreviation: rmi, ridge for muscle insertion (for the tendon from the combined M. biceps and M. brachialis inferior). Fig 8. Left radius of Haestasaurus becklesii (NHMUK R1870). A, lateral view; B, medial view; C, proximal end view (anterior margin towards top); D, distal end view (anterior margin towards top). Abbreviations: antf, anterior fossa; pldc, posterolateral distal condyle; pmdc, posteromedial distal condyle. A and B are at the same scale; C and D are at the same scale. Fig 9. 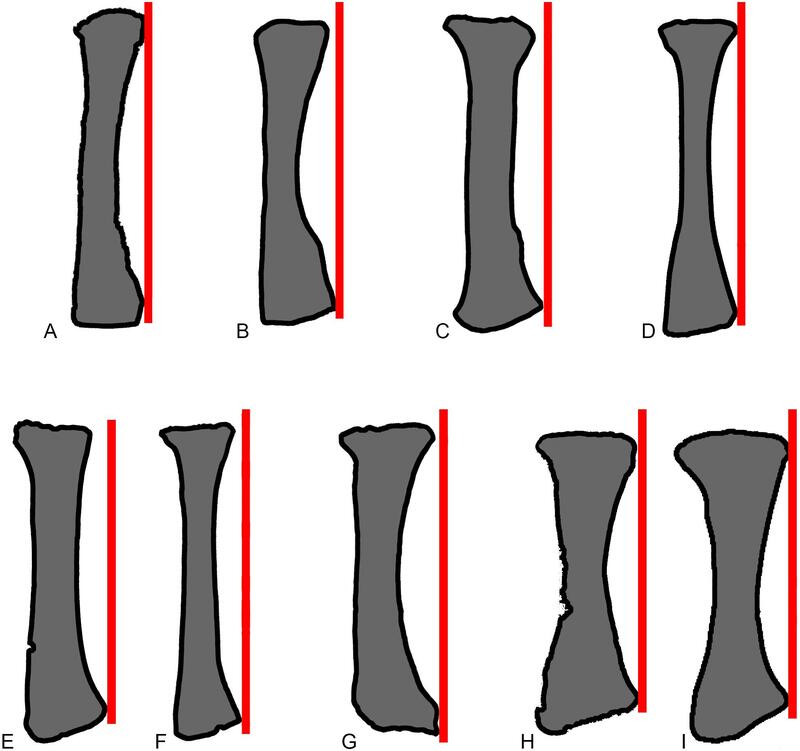 Comparisons of sauropod proximal and distal radii. 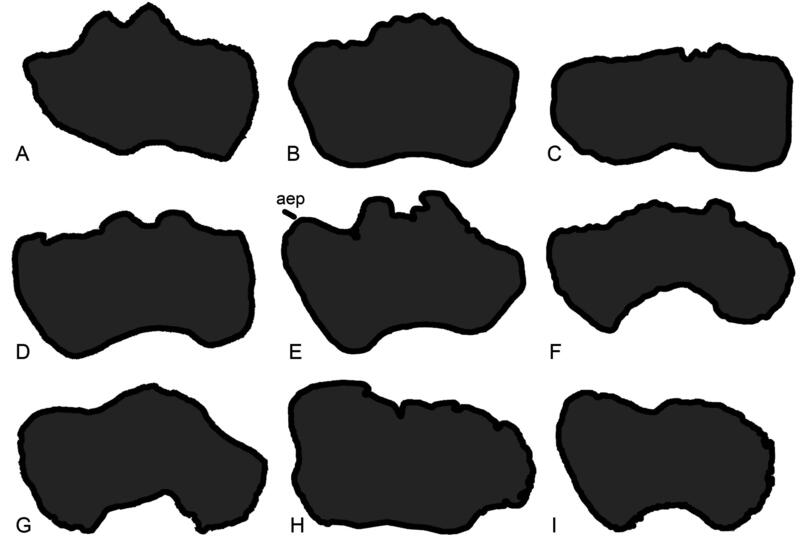 Exemplar profiles of the proximal (A-H) and distal (I-P) ends of sauropod left radii (anterior surfaces towards top): A, I, Ferganasaurus (PIN 3042/1 ): B, J, Apatosaurus excelsus (YPM 1980 ); C, K, Camarasaurus grandis (YPM 1901 ); D, L, Haestasaurus (NHMUK R1870); E, M, Giraffatitan (MfN MB.R 2181 ); F, N, Epachthosaurus (UNPSJB-PV 920, based on photographs by PDM); G, O, Diamantinasaurus (AAOD 603 ); H, P, Neuquensaurus (MLP-CS 1169 ; P based on a photograph provided y S. Poropat). B, E-H, J, and M-P are based on right radii that have been reversed in order to facilitate comparison. Abbreviations: pldc, posterolateral distal condyle; pmdc, posteromedial distal condyle; pmp, proximal medial process. Profiles not drawn to the same scale. Fig 10. Comparisons of sauropod radii in anterior view. Exemplar profiles of sauropod left radii in anterior view: A, Mamenchisaurus youngi (ZDM 0083 ); B, Ferganasaurus (PIN 3042/1 ); C, Apatosaurus louisae (CM 3018 ); D, Camarasaurus grandis (YPM 1901 ); E, Haestasaurus (NHMUK R1870); F, Giraffatitan (MfN MB.R 2181 ); G, Epachthosaurus (UNPSJB-PV 920, based on a photograph by PDM); H, Diamantinasaurus (AAOD 603 ); I, Neuquensaurus (MLP-CS 1169 ). The red lines are drawn parallel to the vertical long-axis of each radial shaft, at a tangent to the lateral tip of the distal end. F-I are right radii that have been reversed in order to facilitate comparison. Profiles not drawn to the same scale. Fig 11. 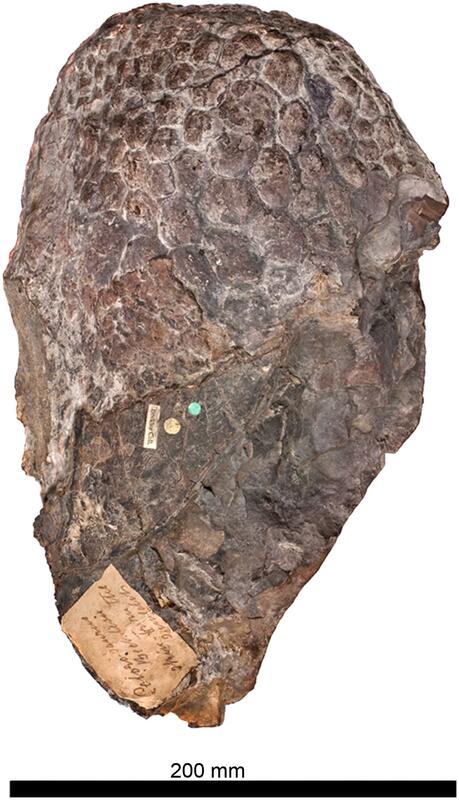 The skin impression of Haestasaurus becklesii (NHMUK R1868). Fig 12. Definition of anconeal fossa depth ratio. 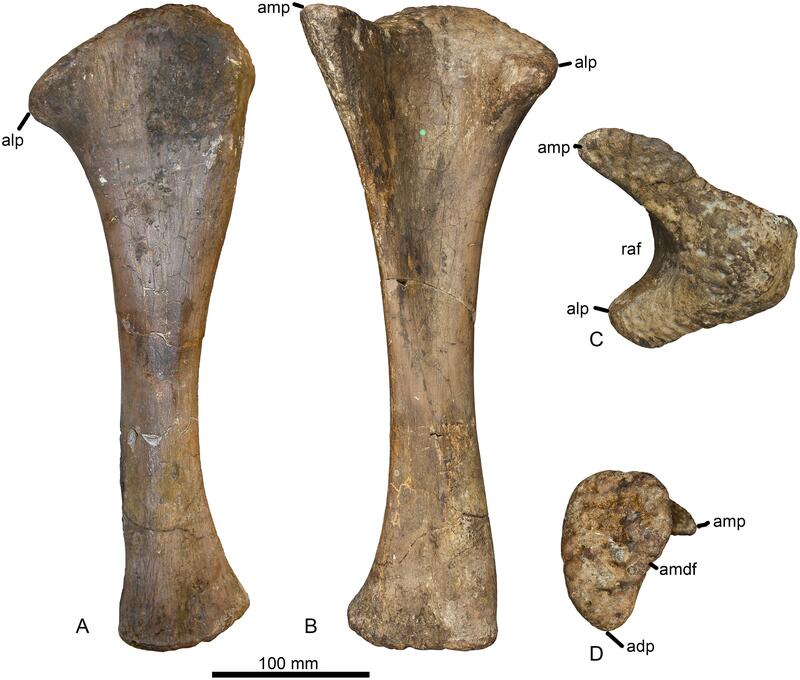 The distal end of the humerus of Camarasaurus grandis (YPM 1901, modified from Ostrom and McIntosh ), showing the definition of the ratio used to estimate anconeal (= supracondylar) fossa depth. Ratio = Y/X (see Table 2). Note that X excludes the anterodistal processes if present: this is because these processes are often absent or highly reduced in titanosaurs, and their inclusion in X would mean that the fossa depth ratio would be estimated in an inconsistent manner across Sauropoda. Abbreviation: af, anconeal fossa. Fig 13. 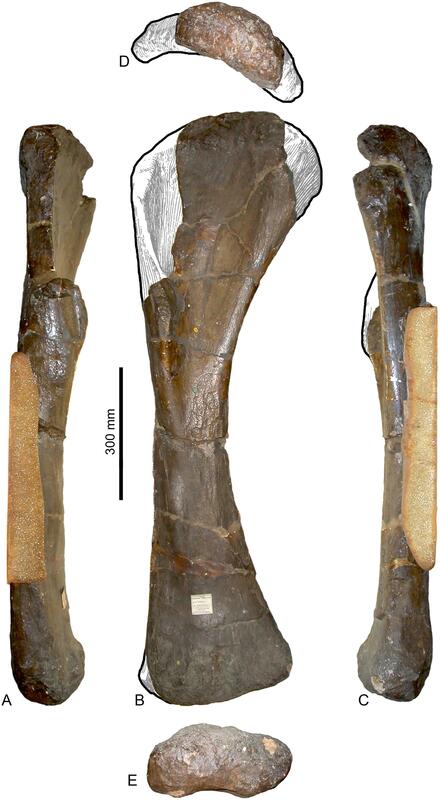 Sauropod ulnae in proximal end view. 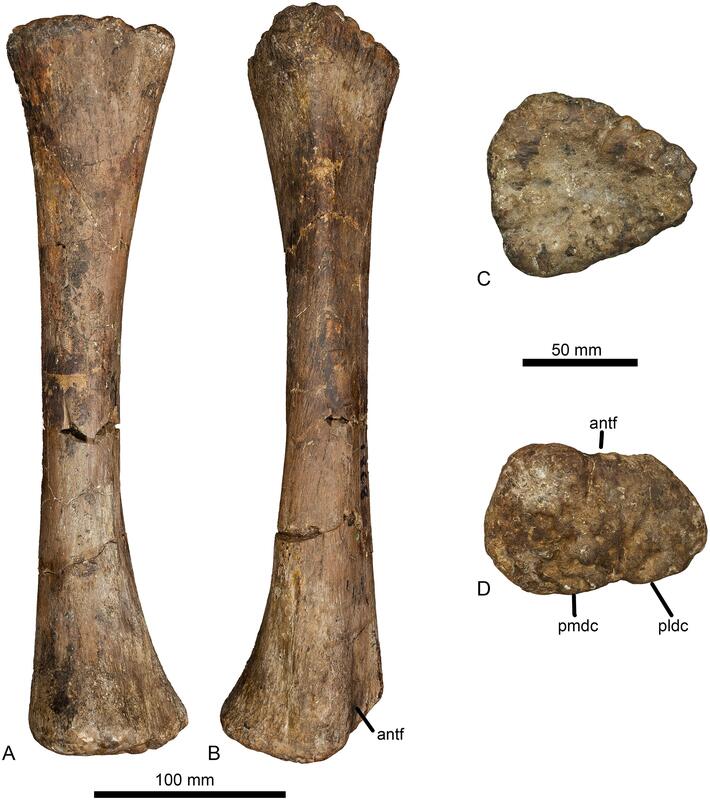 A, left ulna of Haestasaurus becklesii (NHMUK R1870); B, right ulna (reversed so that it looks like a left) of Diamantinasaurus matildae (AAOD 603 [from 80]). Abbreviations: alp, anterolateral process; amp, anteromedial process; pp, posterior process; raf, fossa for reception of the proximal end of the radius. The blue lines in A mark the long-axes of the anteromedial and anterolateral processes; X, Y and Z mark the tip of the anteromedial process, the tip of the anterolateral process and the intersection of the process long-axes respectively. The anteromedial:anterolateral process length ratio (‘Uppl’ in Table 2) can thus be defined as X-Z/Y-Z. Fig 14. Sauropod ulnae in distal end view (anterior towards bottom). 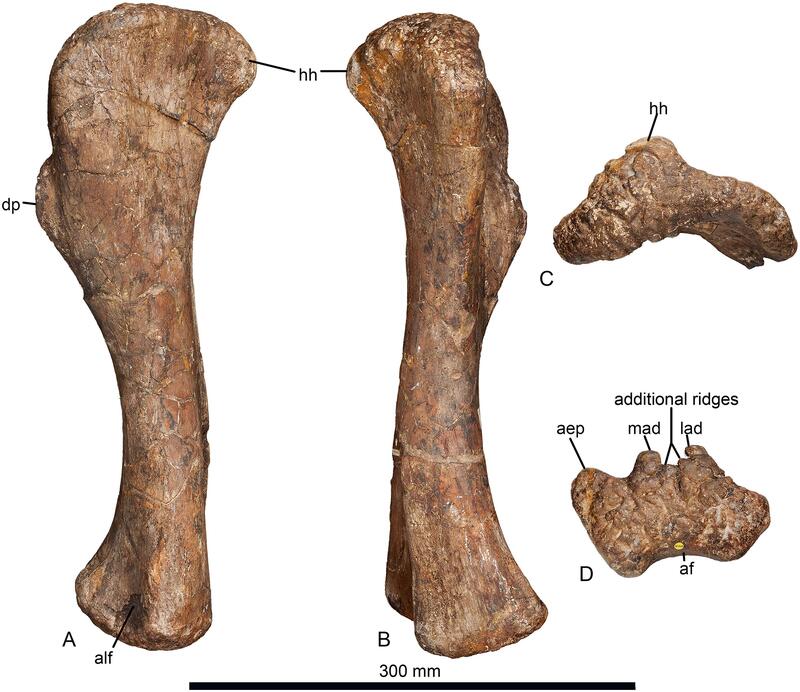 A, left ulna of Haestasaurus becklesii (NHMUK R1870); B, right ulna (reversed so that it looks like a left) of Diamantinasaurus matildae (AAOD 603 [photograph courtesy of S. Poropat). Abbreviations: adp, anterior distal process; amdf, anteromedially facing fossa immediately above the distal end. Fig 15. Strict consensus tree (CSM). 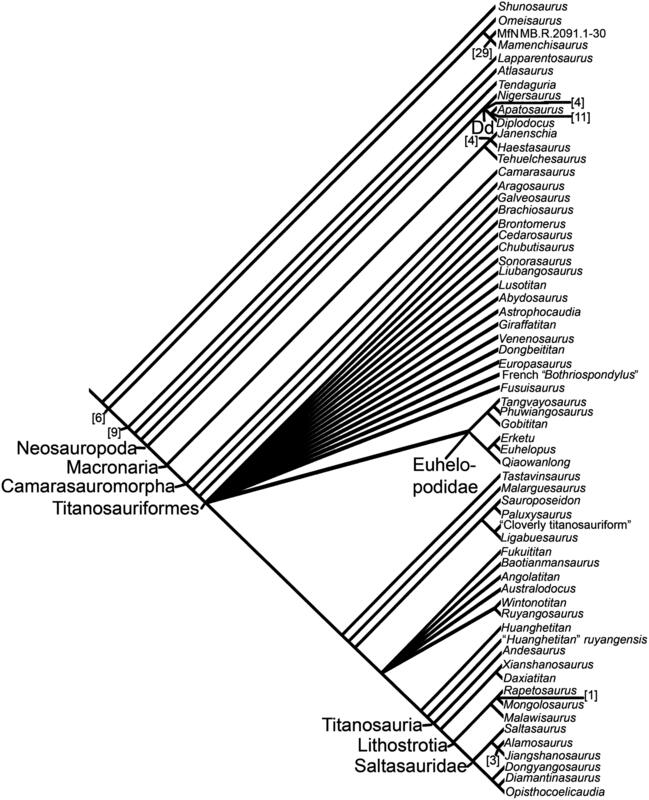 A strict consensus tree based on the 28 most parsimonious trees generated by analysis of the Carballido and Sander  data matrix with the addition of Haestasaurus and six new characters (Tendaguria excluded a priori). GC values (multiplied by 100) are shown in square brackets for all nodes where these values are greater than 0. 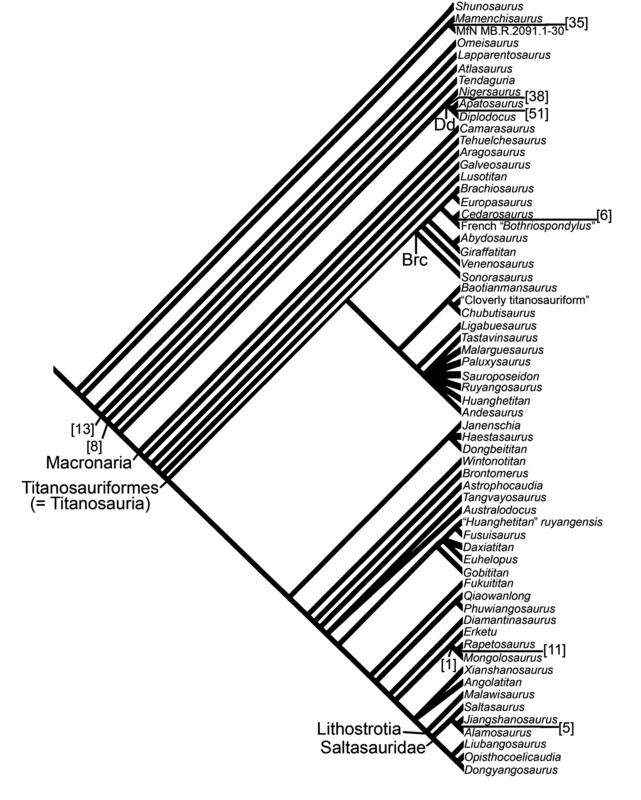 The monophyletic Diplodocoidea has been collapsed to a single branch in order to reduce figure size. Abbreviation: Brc, Brachiosauridae. See main text for details. Fig 16. Strict consensus tree (LSDM). A strict consensus tree based on the 1778 most parsimonious trees generated by analysis of the Mannion et al. LSDM with the revised scores for Haestasaurus and the addition of six new characters. GC values (multiplied by 100) are shown in square brackets for all nodes where these values are greater than 0. Abbreviation: Dd, Diplodocoidea. See main text for details. Fig 17. Strict consensus tree (LCDM). A strict consensus tree based on the 17 most parsimonious trees generated by analysis of the Mannion et al. LCDM with the revised scores for Haestasaurus and the addition of six new characters. GC values (multiplied by 100) are shown in square brackets for all nodes where these values are greater than 0. Abbreviations: Brc, Brachiosauridae; Dd, Diplodocoidea. N.B. 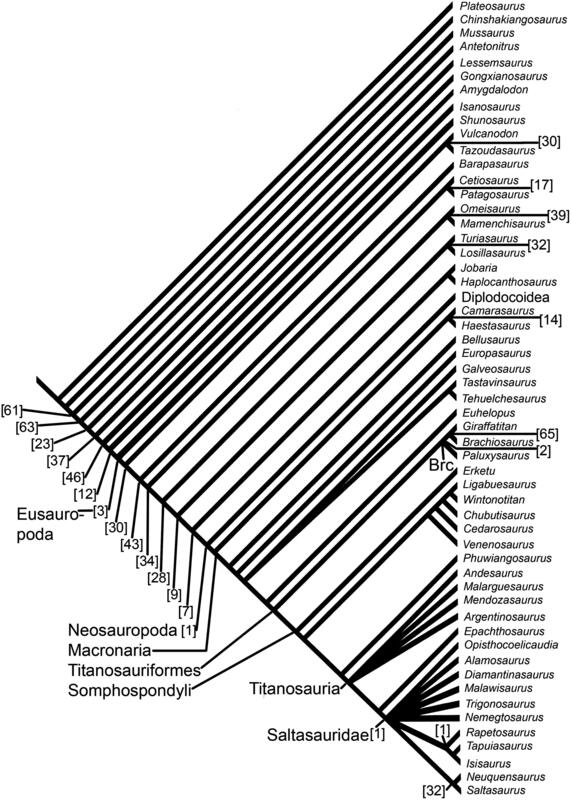 the tree topology shown here means that the clades defined by Brachiosaurus+Saltasaurus (Titanosauriformes) and Andesaurus+Saltasaurus (Titanosauria) are identical. See main text for details. Fig 18. 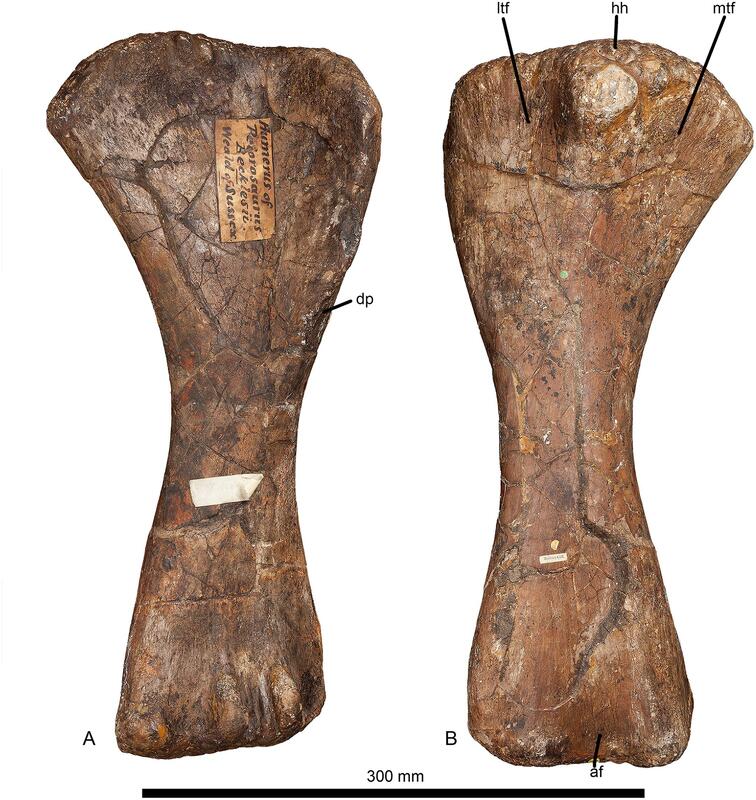 Right humerus of Pelorosaurus conybeari (NHMUK 28626). A, lateral; B, anterior; C, medial; D, proximal; E, distal views. Missing portions have been reconstructed using the humerus of Giraffatitan as a guide.